I recently finished my first sculpture, title "Thank You"! 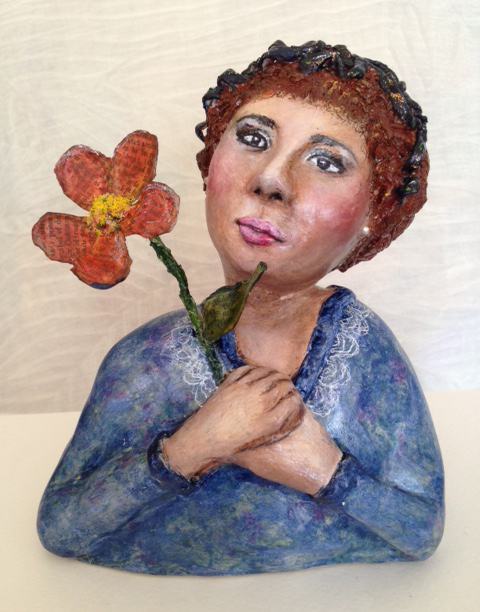 I am taking an on-line class, SoulBearers by Jeanne-Marie Art. The work from the students in this class is exceptional. I had never done anything like this before. I will admit that I was a little leery. All I knew is I like to work with my hands. Here is one of many lessons I have learned on my creative path. When you feel fearful of something you have never done before is a sure sign you are moving in the right direction. You don't have to know all the answers. Just begin, right where you are. The excitement is in the journey. The fear you feel is an integral piece to the excitement puzzle. I know it doesn't feel like it when you're in it, does it? I've been there. I still go there with each new step. It thrills me when I acknowledge these lessons I learn while on my creative path run parallel to life lessons. Which is why... my art is from my heart.